If you’re considering putting your house on the market any times soon, winter may actually be a better time to sell than spring! Homes put up for sale during winter months tend to sell faster than those listed in spring and summer, according to online brokerage firm Redfin. In The Woodlands and Montgomery County areas, the market is still hot, even though temperatures aren’t. Life still goes on during the winter months, as people receive job promotions that require relocation, families expand with new little ones, and empty nesters look to downsize. For the plethora of reasons why homeowners need to sell during winter months, there are an equal number of reasons why buyers need to buy at the same time. In Magnolia, Texas during the month of December, the average number of days a home was listed on the market was 55. Considering this is less than two months, it appears as though the market hasn’t slowed much at all for the season. In The Woodlands, the average was 78 days, so just over two months – still a relatively short amount of time. Buyers in the winter months are more highly motivated than most who purchase during spring and summer. And, with fewer homes for sale, yours will be seen more and you won’t have to worry as much about competition. Pricing your home at fair market value is important during these off-peak months. With fewer buyers out there, the likelihood of a bidding war is minimal and you won’t want to lose a potential buyer if they feel uncomfortable about your list price. As always, consult with your realtor and take his/her advice when it comes to pricing your home. To make your home more appealing when the weather outside is dreary, add some colorful throw blankets to furniture and stack some fresh wood by the fire place to make your living room feel cozy. Brew up some hot chocolate so the kitchen smells great and shoppers can warm up with a cup, and don’t forget the marshmallows. Buying a house is a very emotional experience, and hot chocolate can evoke fond childhood memories. Brighten up the interior by painting with winter white and soft gray colors. Add extra table and floor lamps and make sure they are brightly lit. Display vibrant pictures of your home in the summer with the flowers in bloom and the bright sun shining. 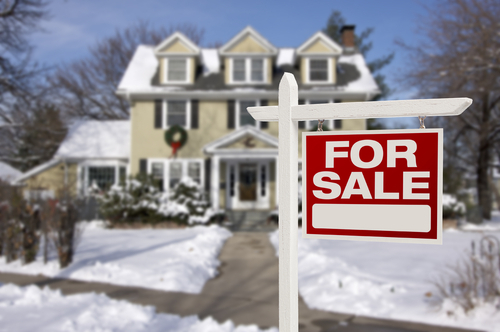 If the time is right for you to sell, don’t hesitate to list your home in January.